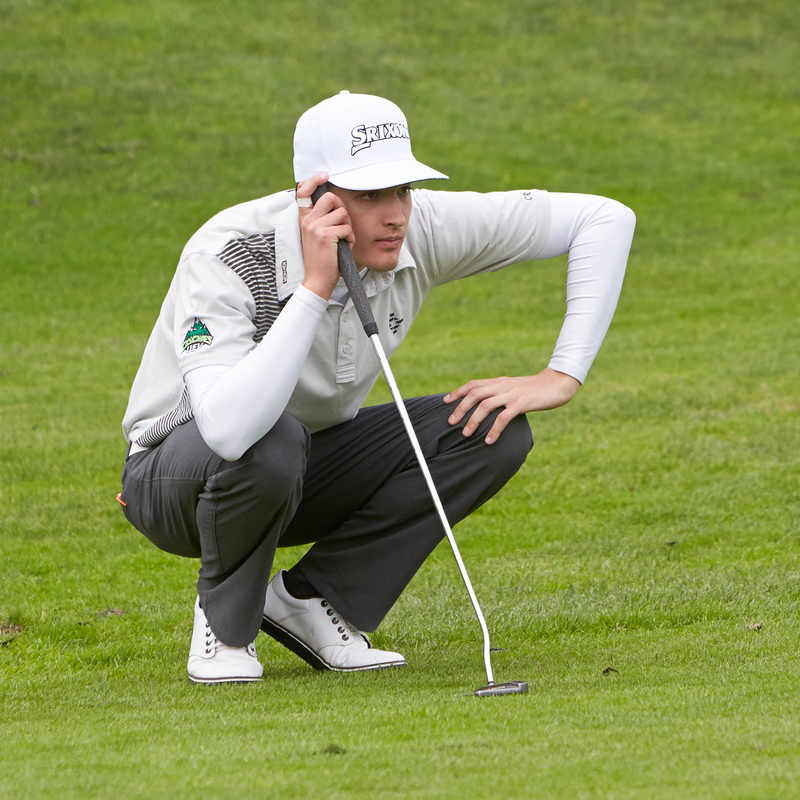 Abbotsford – In many ways, Daniel Campbell’s play was a barometer for the entire University of the Fraser Valley men’s team on Thursday at the Canadian University/College Championship. Campbell had an inauspicious start to the third round at Chilliwack Golf Club, posting a triple-bogey on the par-four second hole. His adventure included a tee shot hooked into the trees, and a two-stroke sojourn in a greenside bunker. But whereas such adversity might torpedo another golfer’s round, Campbell clawed his way back with a vengeance. He played the remaining 16 holes at seven under par, highlighted by an eagle on 11, and finished with a four-under 68. That allowed him to seize the men’s individual lead at -10 for the tournament, four strokes up on teammate Zach Olson and Lawren Rowe of the Victoria Vikes. 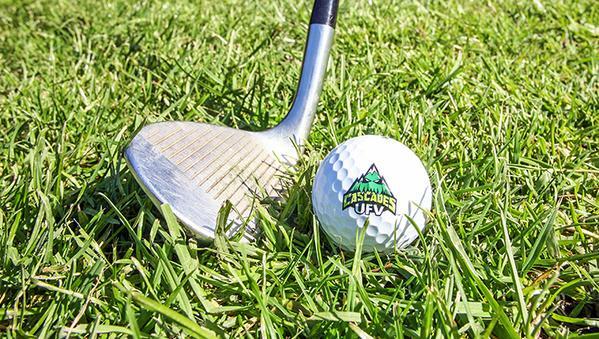 Likewise, the Cascades men’s team – which began the day holding a 12-stroke lead over the UBC Thunderbirds – played the first four holes at a collective seven over par, shaving five strokes off their advantage. But they soon found traction, gaining three strokes on UBC by the turn before scorching the back nine to the tune of eight under par as a group. When the dust had settled, their combined score through three rounds was -25, giving them an 18-stroke cushion ahead of UVic (-7) and UBC (-6) heading into Friday’s final round. Friday’s final round begins at 7:30 a.m., with the awards ceremony tentatively set for 3:30 p.m. depending on what time the round wraps up. Campbell, reflecting on his torrid rally, noted that he’d also found himself down three strokes through two holes on Wednesday after opening bogey-double bogey. “I had to bounce back yesterday too,” the Bellingham, Wash. product said with a wry chuckle. “But I knew there was a lot of golf left – 16 holes, and a bunch of par fives. It wasn’t anything to stress about. I’m playing well right now. Should they finish the job on Friday, it would represent a historic breakthrough for the Cascades men’s team. They’ve never medaled at the Canadian University/College Championship before, with a previous best finish of fourth (2010 and 2015). But Bertram was quick to observe that they’ve got experience taking a lead into the final round of a major national tourney. At the PING CCAA Golf Championships last October, they were two strokes up on UBC Okanagan through three rounds, but dominated the final day to win by 16. Oh, and the individual men’s champ at that event? Campbell. “I think we’ll look to build on that experience,” Bertram said. “We came in here talking about how this is a four-day grind. We’ll go back home tonight, get some sleep, and come in tomorrow just looking to put in one more good day of work. That’s the message, and that’s what we’ve been doing the entire season. Campbell and Olson – who held at least a share of the lead at the end of the first two rounds – are leading the charge, and Halen Davis has also been outstanding throughout the week. He carded an even-par 72 on Thursday, and owns sole possession of fourth place at -5. UFV rookie Kyle Claggett followed a strong front nine (-2) with a tough back nine (+5) to slip out of the top 10 – he’s now tied for 19th at even par for the week. But veteran Connor O’Dell came through with a clutch effort, firing his best round of the week thus far: a one-under 71. He’s tied for 40th at +5. On the women’s side, the Cascades had posted the best team score of the day (+7) in the second round, but they struggled on Thursday. Their third-round score of +23 was the highest among the six teams that made the cut, and they slipped from fourth place to fifth at +50 for the tournament, overhauled by the Toronto Varsity Blues (+46). The top three women’s teams comprise the UBC Thunderbirds (+16), UVic Vikes (+36) and Montreal Carabins (+42), meaning it will require a Herculean rally for the UFV women to reach the podium. Maddie Kapchinsky maintained her spot in the top 10, firing a seven-over 79 to sit at +13 for the tourney, good for solo eighth place. A back injury on the back nine derailed Emery Bardock’s round – after finishing the first nine holes at even par, she was +8 the rest of the way and is now tied for 12th at +15. Hannah Dirksen also carded an 80; she’s tied for 22nd at +22. Be the first to comment on "UFV Cascades Men’s Golf Take 18-Stroke Lead Into Final Round Of University/College Championship"